Tie-Your-Own Cotton Bow Tie available in a variety of colors. Please indicate in order comments what color you want or call to ask about color availability. 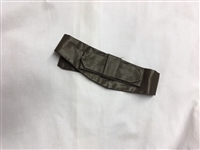 This pre-tied cravat is made out of polished cotton and available in brown or black. A pre-tied fine taffeta ascot for Civilian and Formal Attire. Available in a variety of colors. Please specify which color you want in order comments or call us for color availability.